General Motors India has rolled out its first vehicle meant for the Argentinian market. The Chevrolet Beat marks GM India's first car entering Argentina, with the first shipment leaving the following month. The Chevrolet Beat is already exported to Mexico, Chile, Peru, Central American and Caribbean countries (CAC) and Uruguay. 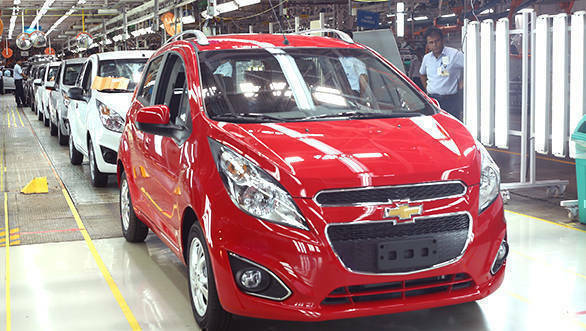 With Argentina joining the ranks, this marks the sixth major export market for GM India. The Beat is the sixth most exported vehicle out of India, with 37,082 units during the 2015-16 fiscal year. The Beat is manufactured at the Talegaon plant, with around 30 per cent of its annual production aimed at foreign markets. The Chevrolet Beat is known as the Spark in other markets and comes in a petrol or a diesel option. The petrol engine is a 1.2-litre unit producing 78PS and 106Nm of torque, while the diesel burner is 936cc unit making 57PS and 142Nm of torque. "In keeping with our commitment to the Make in India programme, we are proud to celebrate the roll-out of the first vehicle for Argentina. In 2016, we plan to export over 50,000 vehicles, compared with 21,000 vehicles last calendar year, reinforcing our commitment to the Indian market and our strong local supplier base. This is part of GM's strategy to make India an export hub for global markets and will help increase capacity utilization at our Talegaon plant. We expect to identify additional export markets going forward," said Kaher Kazem, President and Managing Director, GM India.